It is sometimes said that life in the early days of Texas was an adventure for men and dogs, but hell on women and horses. Susana Dickinson, no doubt, would agree. She will always be remembered as the sole adult Anglo survivor that witnessed the massacre at the Battle of the Alamo. 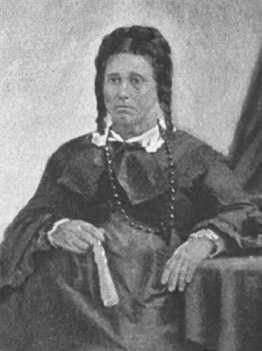 Susana was born in middle Tennessee about 1814 as Susana (often written Susanna) Wilkerson. At the age of only fifteen years, she married Almaron Dickinson in Hardeman County, Tennessee. Within two years, the young couple arrived in Texas and settled near Gonzales in the colony of empresario Green DeWitt. The couple's only child, Angelina, was born there in late 1834. After the Battle of Gonzales marked the beginning of the Texas Revolution in the fall of 1835, Almaron joined a group of volunteers to help secure San Antonio for the Texans. Susana stayed behind with Angelina. After her home was looted a few weeks later, however, she decided to join her husband in San Antonio. When Santa Anna's army approached the town in February of 1836, the family moved into the Alamo. Following the fall of the Alamo, Susana, accompanied by her infant daughter Angelina, was interview by Santa Anna and subsequently released with a message to Sam Houston. After heading eastward from San Antonio, they were found by Deaf Smith and Henry Karnes, scouts for the Texas army. They were taken to meet Houston in Gonzales. Illiterate and still only twenty-two years old when Texas independence was won, Susana requested but was denied a $500 government donation. She married Francis Williams in late 1837, but was divorced by March 24 of the following spring. After three more unfortunate marriages and accusations of taking up residence in a brothel, Susana entered a stable marriage with Joseph Hannig in 1857. The couple soon moved to Austin, where Hannig ran a successful cabinet shop and furniture store. Susana died on October 7, 1883, and is buried in Austin. Although Hannig remarried after Susana's death, he was buried next to her when he died in 1890.